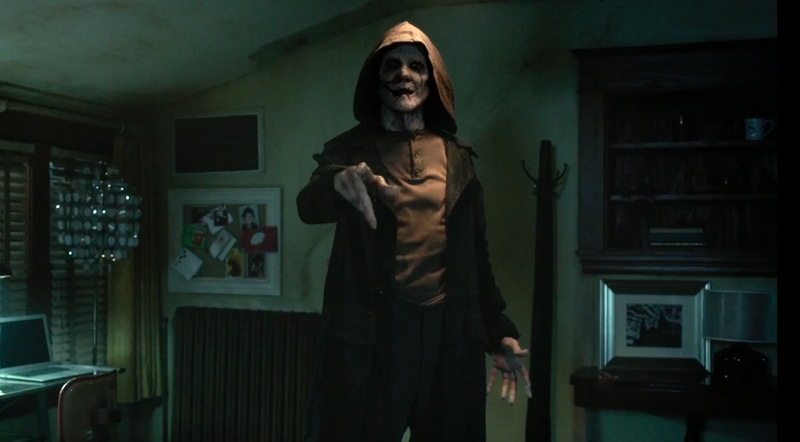 John’s Horror Corner: The Bye Bye Man (2017), PG-13 horror at its cash-grabbing worst about a dumb boogeyman. MY CALL: Well this was a waste of time and a waste of Doug Jones. This is among the few horror movies that actually are at their worst during their effects-rich final act. 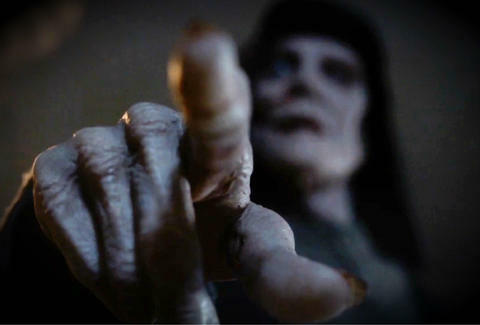 MOVIES LIKE The Bye Bye Man: For more horror whose villains’ names shall not be uttered or whose knowledge alone is a danger, try Urban Legends: Bloody Mary (2005), Candyman (1992), It Follows (2015), Mara (2018) and Truth or Dare (2018). Honestly, they’re ALL better than Bye Bye Man… all of them. Watch them instead. From its outset this movie wants so badly to be taken seriously. Every ounce of lackluster effort is poured into trying to cultivate a most dire atmosphere… and it all fails. All of it. 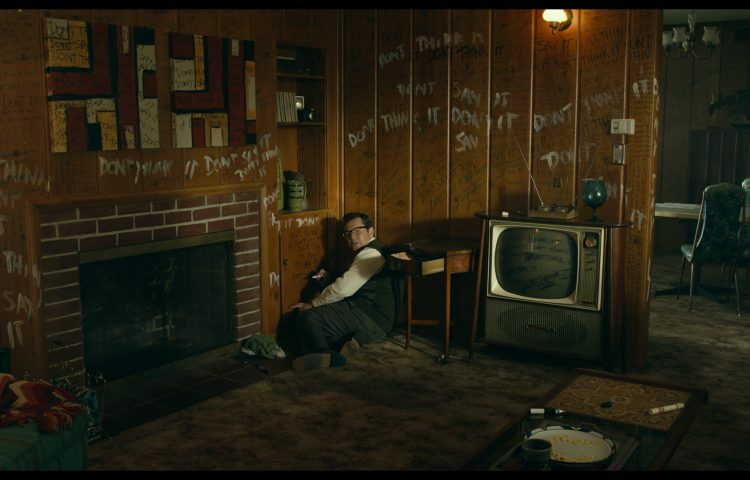 I feel badly for Leigh Whannell (Cooties, Insidious 1-3, Saw I-III). He was trying so hard in the 1969 flashbacks. I’ve been wary of just about any post-1995 horror film below an R-rating. That’s around the time that filmmakers shifted attention from making a good (or simply entertaining) film to making blatant cash grabs. But hey, I guess it’s just business, right? Who am I to complain? I chose to watch it. 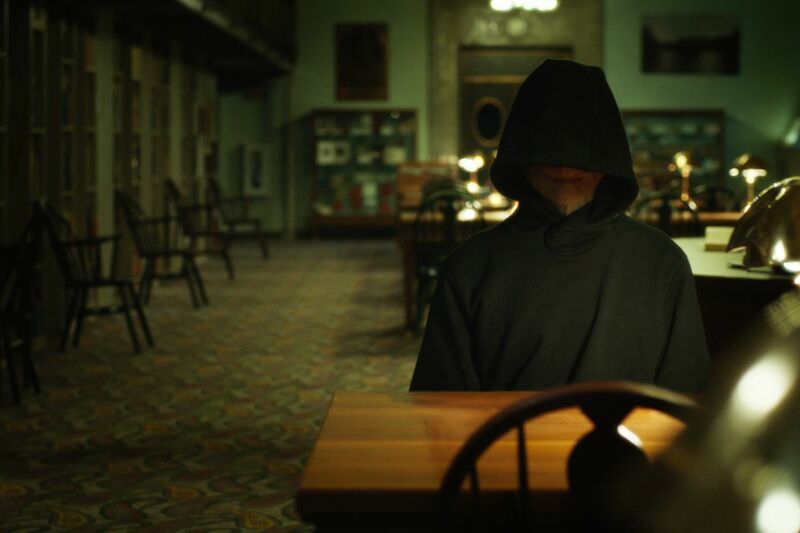 As if upon discovery of a horror movie color-by-numbers workbook, director Stacy Title (Let the Devil Wear Black, Hood of Horror) draws lines between the most typical tropes in the blandest possible ways. It all starts with an old gold coin and some creepy journal scribblings that bring about a curse when said aloud. There’s even a séance performed by a medium. Sadly, none of these classic horror elements will come full circle in the story’s resolution. Why you’d show me an old gold coin in act one and leave it meaningless in act three is beyond me. 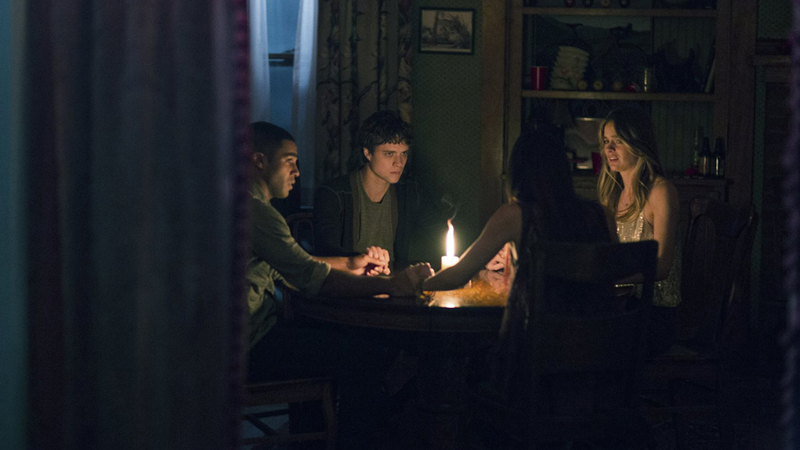 Three students—Elliot (Douglas Smith; Ouija, Stage Fright, Antiviral), John (Lucien Laviscount; Scream Queens) and Sasha (Cressida Bonas)—rent an old house with a dark past that comes to haunt them. We’ll learn some “rules” about this evil phantom, but the movie will quickly forget them as if they never mattered. 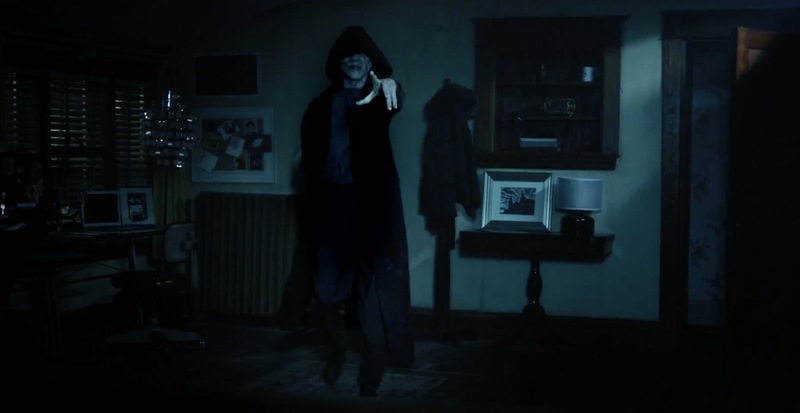 A nondescript hooded Boogeyman, The Bye Bye Man (Doug Jones; The Shape of Water, Ouija: Origin of Evil, Crimson Peak, Absentia) follows crass simplicity. And like a late franchise Freddy Krueger, he must be known and believed in order to have power. However, unlike a Freddy movie, I hated this. Creepy out-of-focus imagery from the shadows harkens Mama (2013) and Lights Out (2016) among countless (and better) others. Stupid drama, visions of out-of-place maggots (in a girl’s hair) and hallucinations of temptation feel cheaply executed. Outside of some decent bloodwork, the special effects are weak—especially with respect to our monster’s appearance, which is probably rivaled by your Halloween-loving neighbor’s make-up. Don’t even get me started on the pointless CGI Hell Hound—errrr… the Bye Bye Man’s pet dog (yet another ill-explained component). Early 2000s ScyFy Channel movies-of-the-week feature equivalent special effects quality to this stupid dog thing. This CGI was upsettingly bad. This wretched film features the worst scissors-fighting in cinema history, the worst sneeze-acting I’ve ever seen, and my favorite character in the entire movie was the exposition-dump librarian. That woman gave it her all and cared more about this film than anyone else in it. Plus, it was a funny gimmicky single-serving character. That character was the best thing about this movie! The scare tactics were weak and we stumble down their abysmal trench when we yo-yo constantly back-and-forth between an evil hallucination and reality culminating in a boring murderous end. It’s so crass—as if no viewer could possibly imagine that this boogeyman could fool your eyes or play tricks on your mind, despite mentioning it in the dialogue countless times! This is what you do in 1950s horror, when the genre is young and viewers aren’t savvy to the means. Or… you simply show the harsh reality after the fact. See how easy that is? And much more horrifying in its reveal! Director Stacy Title needs to either stop making horror movies or aim more for PG tween flicks since she clearly can’t handle this and totally squandered an otherwise excellent creature actor. Once our monster gets close to the protagonist, it’s like she didn’t even know what to do with him. He just stands there with all the physical menace of a high school vice principal and points at you… and then nothing happens. I stopped caring about whatever happened on-screen after minute 15 or 20. Most so-so horror is only good in its last 20-30 minutes. Yet here, those were easily the worst of the film as we watch an impotent evil spirit and his ugly 1990s videogame CGI dog pointing at people and slowly walking down stairs. Meanwhile, you’re expecting the old gold coin or the journal scribblings or some discovery of the boogeyman’s origins to hold some answers to banish it or put it to rest. Nope! The biggest failure was how the gimmicky tagline—don’t think it, don’t say it—is really only an urgent issue in the flashbacks and the very veeeeery end (when it was weakly employed). It’s as if the writers and filmmakers forgot all about how their spectral killer worked! 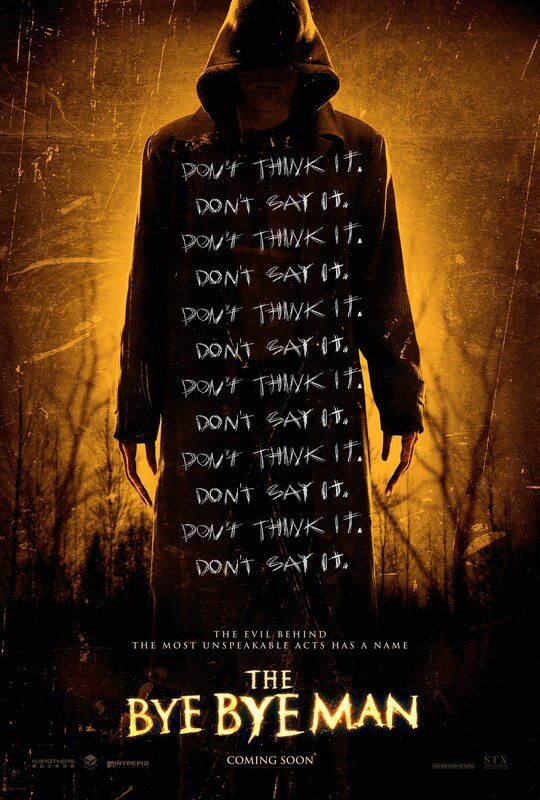 Don’t watch this movie because you love the horror genre. Don’t watch it because you’re an adventurous filmgoer who takes chances on iffy rentals. Watch this if you need a good drinking game movie. It’s fun to laugh at—but not as a “good” bad movie should be. This isn’t a fun B-movie; it’s an awful movie.